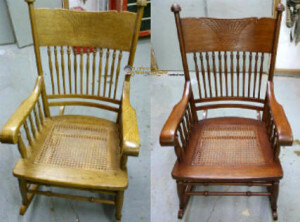 In this tutorial, we will do a color change on this oak rocking chair to match our drawer sample. 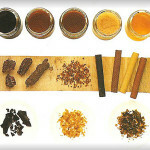 The method is universal and really, it can be performed on just about anything. What are you do when you have a great piece of furniture that is in good condition, but just happens to be the wrong color? Why not change the color? 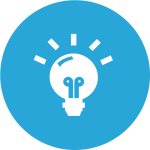 We'll show you how to make this a quick and easy job. 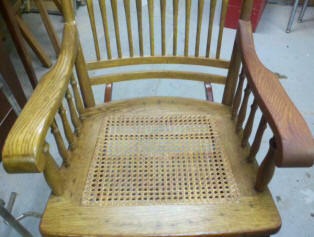 Below: Here is the Pressback rocking chair with caned seat we are going to start with. 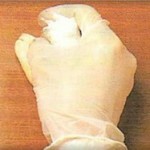 It's in good shape, but we want to change the color to match our sample. 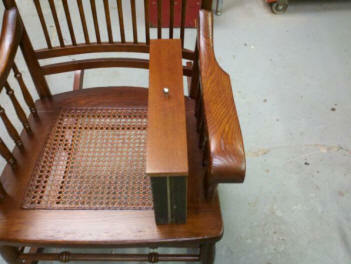 Our sample is a drawer from a small side table that the rocking chair will be sitting adjacent to. I refinished the side table for this client about 7 years ago. Below: We will begin by selecting our stain. 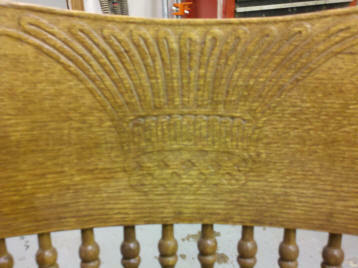 Essentially, we are going to glaze the chair using on oil based stain. 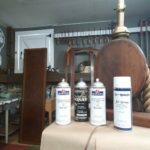 Getting the right color stain is obviously important in this case, because besides changing the color, we are going to custom match it to another piece of furniture. 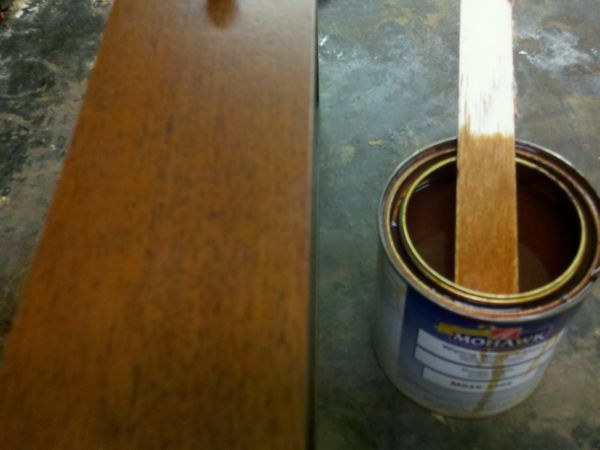 When choosing a stain, I am more interested in the color than the name. 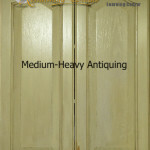 For this color match, I picked Brown Maple wiping wood stain. I dipped the stirring stick in the stain to sample the color, but it's very important that you don't stir the stain ! Below: The next step is an important one. 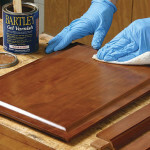 We were careful not to stir the stain, because we want the pigment to stay on the bottom. Using an empty clean container, we will pour out 3/4 of the liquid into the new container. We are now left with only 1/4 of a can of stain, with the undisturbed pigment still on the bottom. 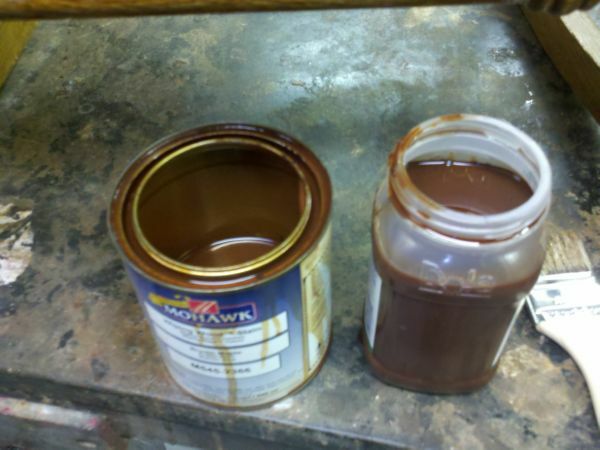 The liquid can be set aside, and added back to the can after we are done glazing. 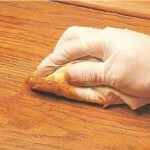 The Reason we removed much of the liquid is to make a concentrated glaze out of our stain. Now that we've done that, we can stir the stain and begin our project. 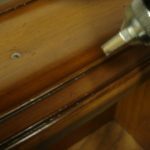 Below: Using a brush dipped in our glazing stain, we will break our project down into sections and glaze one section at a time. 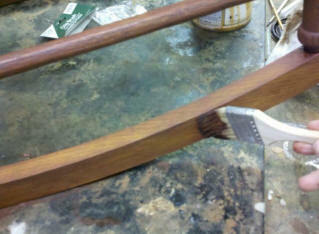 Here, I am starting on the lower right side of the rocker, glazing the two legs, rung and the runner. I prefer to do one piece at a time, so I glazed the legs first, then the rung. 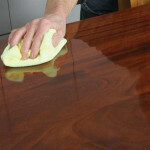 Here, you see me applying the glazing stain to the runner . 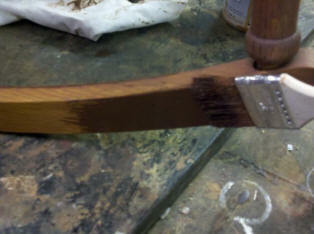 Below: After applying the glaze, we will wipe it off with a dry cloth. 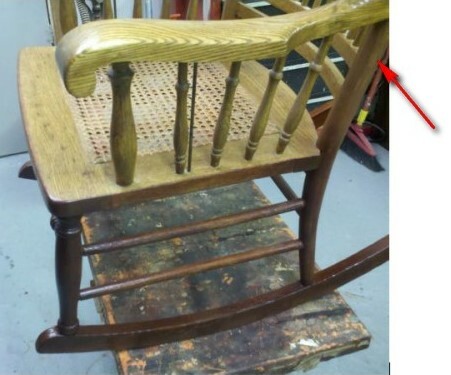 We don't want this chair to "look" glazed, thus the reason for making the glaze concentrated and then removing the excess with a cloth. 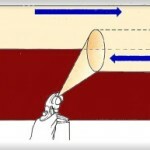 We want to avoid those brush lines that are typical in our standard glazing technique. Below: You will notice in the picture below, I continued the glaze on the back leg all the way up to the bottom of the arm. 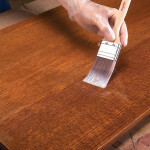 It's important to work in continuous sections so that you never overlap your fresh stain with dry stain. If you do, the new stain will soften the dry stain and you will have to do the whole section over because you will never get them to blend. 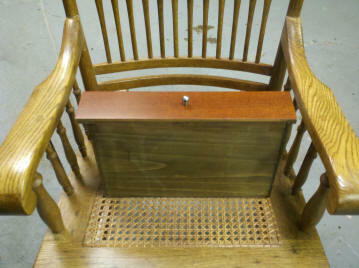 Below: I am now finished with the bottom of the chair. Our next step is to seal in our glaze. 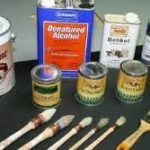 Sealing in the glaze will protect it, so that if / when new glaze touches the finished glaze, it will have no adverse effects and will wipe right off. 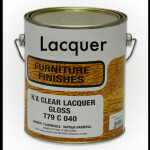 To seal in our glaze, we will use an aerosol lacquer, like the one pictured below. 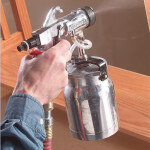 Here is a link to Aerosol lacquers we use. 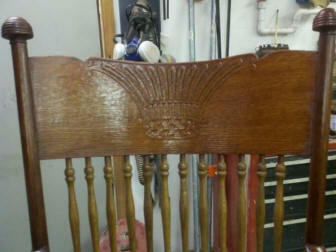 With the bottom of the rocker finished, we can move on to our next section. Below: Here, I choose to glaze the arm next. Below: I then moved to the other side of the chair and repeated the same process. After glazing, I sealed in both arms before proceeding to my next section. Below: While the finish on the arms is drying, I glaze both sides of the back panel and then seal that glaze in with my aerosol lacquer. 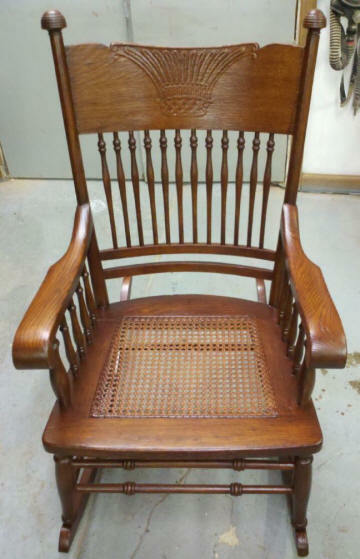 Below, we have the finished Rocking Chair. 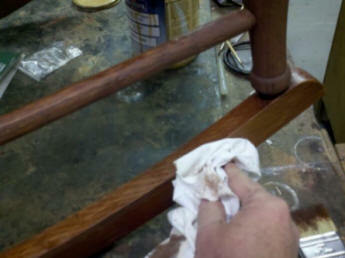 I apply one more coat of Aerosol lacquer to the entire chair, being careful not to apply my spray too heavy. 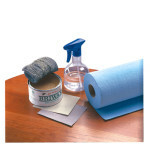 We want to be careful with the aerosol and avoid creating runs in the finish. Our Rocking chair has been totally transformed. 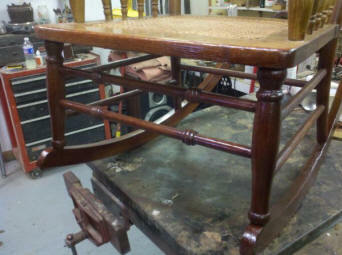 going from light oak, to where it now matches our medium mahogany side table. Using the clear lacquer aerosol gives the chair an adequate protective coating for a durable lasting finish. 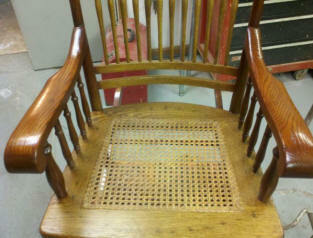 Below: The finished chair.....now wasn't that better than stripping and sanding the entire chair? 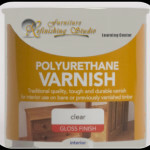 It's all in knowing the correct steps, and that's what we hope you gain here in the Furniture Refinishing Studio.